A group of young entrepreneurs brought School of Rock from Philadelphia in the US to the Philippines. Find out how the love for rock and roll inspired them to buy and operate the franchise locally, the first of its kind in the country. Ask Emiliano “Nino” Caruncho IV, Parkin Chiu and Benjamin Go Jr. why they decided to bring the School of Rock franchise to the Philippines and within a minute, it will become obvious: They love rock and roll. School of Rock Philippines opened at the Greenhills Shopping Center in San Juan in April 2012, under Rock Nation Music School Philippines Inc. It was the first time the U.S. brand set its foot in Asia. It took two years of conference calls between the U.S. franchisor and Caruncho’s group before they were able to finalize the deal. Caruncho briefed the U.S. franchisor about his and his partners’ entrepreneurial background, attitude, business mindset and financial capabilities. They also had to show the U.S. franchisor they had the right management skills to operate the franchise. The U.S. franchisor, meanwhile, arranged to have the three talk to other franchise owners in the United States and Mexico just to make sure they could be entrusted with the brand. The challenge for the Philippine franchisee was introducing the concept to the community. The three friends worked to get media coverage and sought advertisements in Facebook, banner ads, and lamppost banners in the vicinity of the school. Why enroll at the School of Rock? Caruncho says the school will teach music first before theory. “We want students to enjoy playing music first before teaching music theory. This method inspires and motivates students to learn faster because they enjoy what they are doing. Teaching music theory, notes, and scales at the start intimidates kids, which eventually causes them to lose interest in learning music,” he says. The school only hires gigging musicians as instructors, so they have street cred and can share their experience of playing onstage firsthand. The school currently has three programs: Rock 101 lets beginners learn the basics, including technique, music theory, and the dynamics of playing in a group; Performance Program lets students show what they worked for—on stage; and the Adult Performance Program allows students to get individual instrument lessons along with weekly band rehearsals until they can perform live on stage. Caruncho says expansion is not yet in the works. “We would like to concentrate on the success of this first branch before expanding elsewhere,” he says. 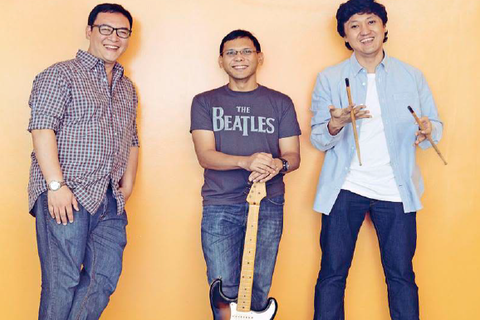 Photo shows business partners and band mates (from left) Parkin Chiu, Emiliano ‘Nino’ Caruncho IV, and Benjamin Go Jr. This story was originally published in the December 2013 to January 2014 issue of Entrepreneur magazine. Subscribe to the print or digital version of the magazine through following this link.